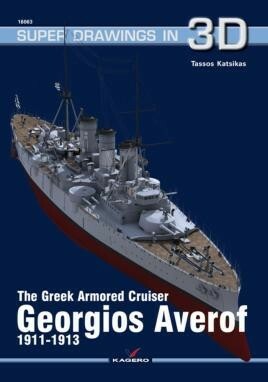 Georgios Averof (Θ/Κ Γεώργιος Αβέρωφ) is a Pisa class armored cruiser of the predreadnought era. The ship was the third from the series of Pisa class ships after Pisa and Amalfi. The ship initially (1907) was ordered for Marinha do Brasil, but one year later the Brazilian government abandoned the order. As a result of this decision, the construction works for the armored cruiser halted. However in 1909 the ship was acquired by the Royal Hellenic Navy and named Georgios Averof. Another excellent book on a specific subject, recommended.